To address our deeply held orthodoxy in 1000 words is tough — still let me try. We want change in education that promotes STEM learning, creative problem solving and twenty-first century skills. Change sounds hopeful, but it cannot come while we foster the same old narrow literacy mindset that has been limiting learners and teachers for generations. I saw an example of our problem in an otherwise thoughtful book, Powerful Problem Solving. Max Ray, sharing 20 years of work with his colleagues at the Math Forum, echoes many voices when he says math practice that focuses on making calculations and memorizing formulas turns off learners and misses the exciting essence of problem solving. Instead, Ray says, we must foster a problem solving culture in classrooms. A book promo says,“We give students opportunities to see problems in big-picture ways, and discover multiple strategies for tackling a problem.” So far so good. 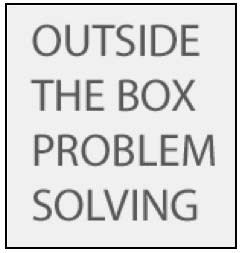 In the first chapter, Ray offers a set of exercises designed to get kids thinking outside the box about problem solving — including kids who struggle with math. He offers several team building exercises and what he calls a “‘classic” — How to Make a Peanut Butter and Jelly Sandwich. Indeed, I’m told this has been a staple in Language Arts for generations, but seeing it in a math problem solving context got my attention. The idea is simple — students are asked to write a set of instructions to make a PB&J sandwich. After students finish writing, someone is asked to follow the instructions while being hyper literal. I’m told this can be hilarious — full of insights and a big mess — as incomplete instructions may lead to spreading peanut butter by hand on an unopened loaf of bread. After often dramatic failures, students in small groups are tasked to try to revise their texts — and then see how their new instructions work. In the final key step Ray calls the “debriefing,” students are urged to reflect on what they’ve learned. Ray’s suggestions for possible areas of discussion follow the classic pattern. They focus on good word choice, the need for editing and the value of revision, all “encouraging students to think hard about what makes a good explanation.” Having students “think hard” about communicating effectively is an exciting idea. If only we could let them. Seeing this classic exercise used in a problem solving context was an eye-opener — showing how our text focus disconnects us from serious problem solving and common sense. We offer this exercise that highlights the serious limitations of text as a tool for sharing ideas. Indeed, we insist on starting with text because we expect widespread failure from young writers, even from the top students. Having shown how hard it is to share ideas in text alone we then model our “solution” to the problem by encouraging students to redouble their focus on text skills. This is madness. Not because students don’t need to learn to write clearly, but because an obvious solution to better communication is to try enhancing their writing with visuals. How many people could assemble something they’ve bought if the instructions didn’t come with visuals as well? To insist learners focus on communicating in text alone ignores all we know about the ways visuals enhance communication. In fact it ignores the history of integrated STEM literacy (ISL) where scientists, mathematicians, and engineers use pictures with text as natural partners. The reason for ISL is simple, as the NSF says, “some insights can only be made widely comprehensible as images…” But words are precious here so let’s stay with our text problem. Max tells us this classic PB&J exercise speaks to precision in communication and problem solving. Of course, learning to write clearly is essential. But when will we admit what this exercise so easily highlights: There are serious limitations to effective communication using text alone. Unfortunately when we model more focus on text as the essential fix we are telling them to ignore this obvious problem. In fact, searching the Web, I’ve found dozens of examples of this PB&J process, now offered by experts as way to explore better communication skills, get hands-on with STEM learning, linking STEM to literacy, foster better collaboration and effective teamwork and more. All these exercises are built on expected text failure and all encourage open discussion and brainstorming — yet all steered learners (and exercise leaders) to focus on more effective use of text in isolation as the solution. 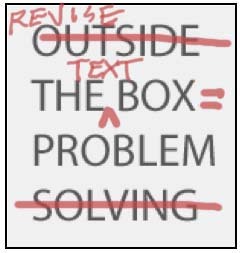 I hope the reader finds it a bit scary how exercises built on text failure that claim to promote open brainstorming and problem solving do just the opposite — limiting everyone, teachers and students alike, to text-narrow solutions. No one suggested learners might want to try linking drawing with text as a more precise way to communicate ideas on paper and on the screen. I’d like to tell you this text-focused exercise was a fluke, that Ray’s book had lots of examples of students using drawing as a math tool. But the opposite is true. Like so many otherwise thoughtful math texts, in their focus on making math more engaging by emphasizing real life problem solving, they somehow miss the role visuals can play in STEM learning. Indeed, Ray’s chapter on “The Problem Solving Process and Metacognition” has no drawings at all. If you are not sure what learning vocabulary Ulm is talking about you are not alone. But I’m afraid I’m out of words. WARNING: Below here is 1000 words +. We know text skills are difficult for many learners, but we continue to insist that text is our best (usually only) option for better communication or problem solving. The history of STEM, from Galileo’s groundbreaking visual evidence of the moon as more than a glowing plate, to Alexander Graham Bell’s early modeling of ideas for the phone, to NASA engineers’ moon landing plans, all tell us otherwise. The text narrow problem solving modeled in these popular PB&J exercises reminds me of the insanity definition often attributed to Einstein, “Insanity is doing something over and over again and expecting a different result.” An image comes to mind, another silly classic from my student days when math was often deadly and scary. Does anyone remember the “What to do when you get peanut butter stuck on your finger?” joke? Lick if off. Now it is stuck on your tongue. Try to swallow it. Now it’s tuuck tu taa ooof of yo mouffffff. Use your finger to get it off… and repeat forever. How long can we can keep our text-focused learning loops going as students suffer? If you are concerned that I’m over my word count I failed for sure. But, if you wondered where all the pictures were, or what Galileo, Darwin and NASA have to do with drawing as a thinking tool we are getting somewhere. I hope you’ll read more. I can only solve problems using pictures. 5 1/2 years as a PhD student at MIT, and another 6 years as a scientist at MIT didn’t change that. I have to have a white board by my desk. I used to have an office with a huge white board or chalk board. Now in industry, I have a cube, unfortunately – but I have a rolling white board in it. It is the only way I can communicate. I think you are right on the mark. Guilty as charged! I’m sorry to say that in my years as an elementary school teacher, although I never actually did the PB&J sandwich challenge with my students, I often heard it referred to — and I accepted it as a valid way to get kids to see the importance of writing clearly. I didn’t see that by limiting students to using only text to give directions, we were limiting them to a method that was not the most appropriate for the task instead of opening up the problem and asking them to figure out the most effective way to convey what needed to be done.